This morning, before I left for work, I said goodbye to Oakley. She responded with an upturned, “Okay!”. And so, of course, I mocked her, responding with equal pep. I mean, that is my job as her father, right? We went our separate ways for the day; me to work, Oakley to school. Tonight, after the girls were in bed, I got to see two pretty funny things. 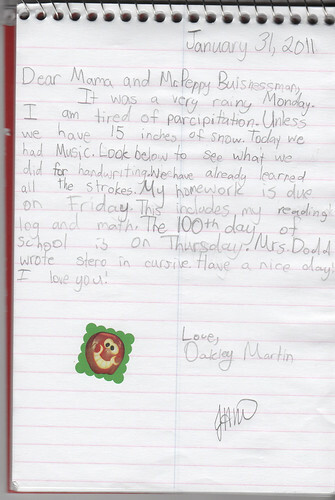 First, Oakley’s steno, which includes a daily note from Oakley, written during school. It was a very rainy Monday. I am tired of parcipitation. Unless we have 15 inches of snow. Today we had Music. Look below to see what we did for handwriting. We have already learned all the strokes. My homework is due on Friday. This includes my reading log and math. The 100th day of school is on Thursday. Mrs. Dodd wrote steno in cursive. Have a nice day. I love you! I can’t believe that when Greg was only three months old his parents took him on their greatest adventure of their lives! They had a baby! It must have been so troublesome. The way Greg’s older and younger life was made me so glad for how fortunate I am to have such a nice childhood. I can’t believe that when Christa was only eight she began to have seizures and epilepsy. I am so sorry for her. Layer, upon layer, upon layer of gratitude. That’s what I have. A second grade daughter who writes like this. A teacher that transcends the job of teacher. A child who displays empathy. And gratitude. And a sweet title, like “Mr. Peppy Businessman”.